Dr. Sponseller is an assistant adjunct professor at Augusta University. Dr. Sponseller graduated with honors from Northeastern State University College of Optometry in 1990. She is the recipient of the Harold Kohn Memorial Award for Research, Varilux Award, and the Outstanding Low Vision Clinician Award. Dr. Sponseller performs general eye examinations and contact lens examinations as well as performing all of the pre-operative and post-operative surgery care at the Eye Care One Laser Vision Center. Dr. Sponseller completed an internship in retinal ophthalmology in Kalamazoo, Michigan as well as an internship in pediatric and vision therapy. 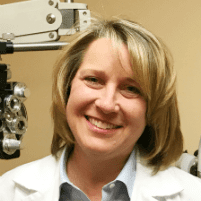 Dr. Sponseller is certified by the International Association Board of Therapeutic Examiner in Optometry and the National Board of Examiners in Optometry. Dr. Sponseller enjoys private practice as well as performing all of the pre-operative and post-operative surgery care at the Eye Care One Laser Vision Center.